JTJB held its Eastern Maritime Seminar on Thursday 18th June 2015. 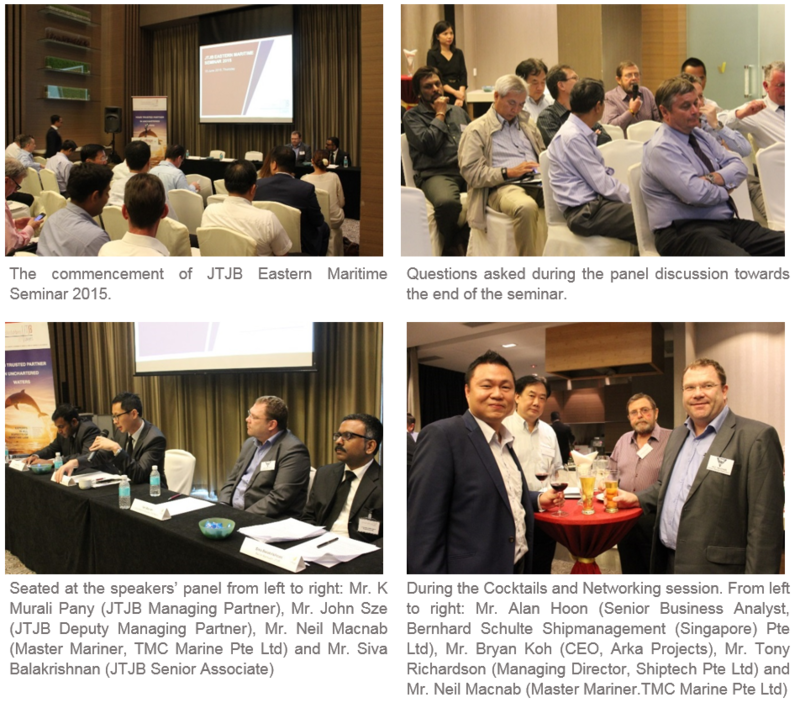 The JTJB Eastern Maritime Seminar is part of an inaugural event consisting of a series of 2 Seminars organized by the firm for companies in the Eastern and Western offshore and maritime hubs of Singapore. JTJB’s Deputy Managing Partner, John Sze spoke on Casualty Management, Preservation and Collection of Evidence followed by Senior Associate, Siva Balakrishnan on Charterparties while JTJB’s Managing Partner, K Murali Pany discussed the topic of Laycan, Laytime, Demurrage, Detention and Despatch. We were also pleased to have Mr. Neil Macnab, Master Mariner from TMC Marine as our guest speaker who did a presentation on LNG – Incidents, Bunkering, Developments and Risks. The Seminar ended off with an interactive and lively panel discussion on the topics and other issues relevant to the industry. The event was well-attended by representatives from various offshore and maritime companies. We would like to thank everyone who attended for their support. Click here to view photos taken at the seminar. The JTJB Western Maritime Seminar 2015 will be held in November. Visit our events page to view upcoming events and latest updates. JTJB’s Shipping & Admiralty Practice Group is one of the most experienced shipping practices in Asia, and is a key area of practice at our firm. For more information on the above topics discussed at the seminar, please contact K Murali Pany at Murali@jtjb.com or John Sze at Johnsze@jtjb.com.